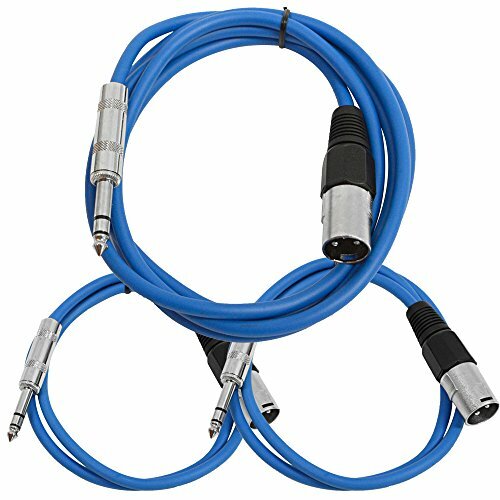 Seismic Audio - SATRXL-M3C-Blue - 3 Pack of Blue XLR Male to 1/4 Inch TRS Patch Cables- XLR to TRS Cable Kit - One 6 ft One 3 Ft, One 2 ft XLR-M to 1/4'' Patch Cords by Seismic Audio at Right Clearing. MPN: SATRXL-M3C-Blue. Hurry! Limited time offer. Offer valid only while supplies last. XLR Male to 1/4 Inch TRS Patch Cable Kit - 3 Pack Blue Model Number: SATRXL-M3C-Blue (Pack of 3). High Quality XLR Male to 1/4'' TRS Connectors. XLR Male to 1/4 Inch TRS Patch Cable Kit - 3 Pack Blue Model Number: SATRXL-M3C-Blue (Pack of 3). High Quality XLR Male to 1/4" TRS Connectors. Various Lengths: One 6 Foot XLR to TRS Patch Cable, One 3 Foot XLR to TRS Patch Cable and One 2 Foot XLR to TRS Patch Cable. Balanced and Shielded. Heavy Duty Flexible Rubber JacketSeismic Audio XLR to 1/4" TRS Patch Cables are made of the highest quality materials, yet affordable for every musician. Seismic cables are made with every musician in mind, from the novice to the pro. They are designed to provide years of reliable, high quality sound and their durability is superb. Balanced XLR to 1/4" cables are typically used to connect mixers to equalizers, crossovers, compressors or amplifiers. Some mixers or rack mount gear have XLR connections where others have 1/4". These are ideal for adapting the two together. 22g Oxygen-Free Copper (OFC) conductors for enhanced signal clarity and superior RF rejection. 2 Units - 10 Foot - Canare L-4E6S Star Quad, Patch Cable terminated with Neutrik-Rean NYS ¼ Inch (6.35mm) Gold TRS Stereo Phone Plugs - CUSTOM MADE By WORLDS BEST CABLES.